Lurelle Van Arsdale Guild accomplished more in one lifetime than most would attempt in seven. Guild was an avid collector of antiques, a successful illustrator, an accomplished writer, an amateur architect, and most importantly for our purposes here, an industrial designer. 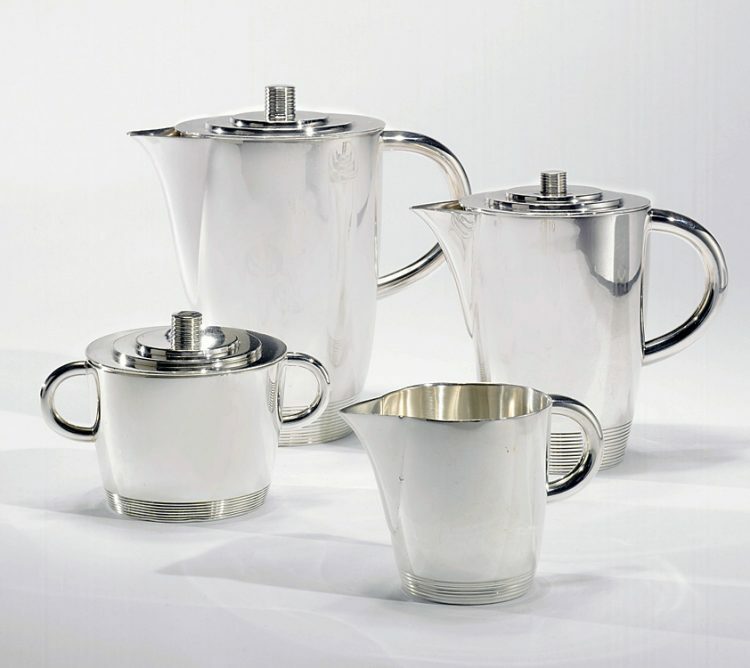 Within the Kamm Teapot Collection, there is an elegant example of Guild’s work for International Silver Company. This four-piece silver-plated set includes a coffeepot and a teapot, both containing lids, as well as a lidded sugar bowl and a creamer. These are cylindrical forms with uncovered triangular spouts and simple c-shaped handles. Ribbing encircles the bottom portion of each container and is incorporated on the finials. The entire set has a highly polished smooth surface. This four-piece set epitomizes Guild’s approach to design. Guild did not pretend to be a visionary, nor did he want to solely recreate the past. Instead he consistently strived to create up to the minute designs that struck a balance between modern and traditional styles. As the designer, George Nelson stated in a 1934 issue of Fortune, Guild was “never ahead of his time or behind it.” He simply understood that “not everyone is going to have a ‘modern’ house; there will continue to be people who will want, and will have period houses, period furniture.” Coffee and tea sets like this one, could “adapt to [a family’s] needs and means” as well as an individual’s personality and “ideals of comfort and beauty” no matter the setting or environment. Throughout Guild’s career, he was regarded as one of the top industrial designers in the United States. Today, many scholars tend to overlook Guild’s contributions, placing emphasis instead upon his peers. A comprehensive history of twentieth century American industrial design should include Guild and his work. Lurelle Van Arsdale Guild was one of the most prolific designers of his time. He created splendid works such as this tea and coffee set in the Kamm Teapot Collection. Nichols, Sarah, ed. Aluminum by Design. New York: Harry N. Abrams, 2000. Obermeyer, Joan. “Seven Lifetimes in One Describes Lurelle Guild.” The Darien Review (15 November 1973), 4. Pulos, Arthur J. American Design Ethic: A History of Industrial Design. Cambridge, MA: The MIT Press, 1988. Joan Obermeyer, “Seven Lifetimes in One Describes Lurelle Guild,” The Darien Review (15 November 1973), 4. R.C. Fyne, “The Shape of Things to Come,” Sales Management (20 November 1943), 21. Francis Still Wickware, “Durable Gods Go to Town,” Forbes (15 October 1936), 33. Preliminary questionnaire on Industrial Design profession, Fortune (1958), Lurelle Guild Papers, Special Collections, Syracuse University Bird Library. Cynthia Hitchens interview, interview by Allie Farlowe, Williamsburg, VA, 26 February 2004. Jeffery Meikle, Twentieth Century Limited, Industrial Design in America (Philadelphia: Temple University Press, 1979), 84. Tony Linck, “Personality ‘Close-up’ on Lurelle Guild, Industrial Designer” Life (1946), Lurelle Guild Papers, Special Collections, Syracuse University Bird Library. Howard H. Van Lenton, An American Heritage, A Book about The International Silver Company (Dallas, TX: Taylor, 1977), 11. Carolyn Jacks, “What’s New in South Bend Shops,” South Bend Ind. Tribune (10 June 1934), n.p., Lurelle Guild Papers, Special Collections, Syracuse University Bird Library. Stanley Abercrombie, George Nelson: The Design of Modern Design (Cambridge, Massachusetts: MIT Press, 2000), 50. Lurelle Guild, The Inexpensive Way to Decorate (Scranton, PA: Scranton Lace Co., c.1940), n.p. Guild, c.1936, 3.